It’s World AIDS Day on Tuesday 1 December 2015. As always, the event is marked across London with strong support from the city’s bars and clubs on the weekend before. Tom Knight and Bloc Bar present a “World AIDS Day Extravaganza” with performers from all corners of the scene to raise funds for GMFA. The event runs from 6pm to 1am at Bloc Bar (18 Kentish Town Road, NW1 9NX). More details on Facebook. Moto Blanco joins XXL’s roster of DJs for a World AIDS Day fundraiser at XXL (Pulse, No 1 Invicta Plaza, SE1 9UF) from 10pm to 7am. Tickets are on sale now. £1 from the entry price will be donated to GMFA, matched by XXL. Positive East’s Red Run returns to Victoria Park with a 5k & 10k runs at midday on Sunday 29 November. Registration is just £15 and is open until race day. The Two Brewers and Wandsworth LGBT Forum present their World AIDS Day fundraiser at The Two Brewers (114 Clapham High Street, SW4 7UJ) on Sunday 29 November. Hosted by La Voix and Myra Dubois and featuring Miss Jason, Sandra, La Voix, CK Crystal and Kelly, Oli Parr, BAGA CHIPZ, Wain Kara Douglas (Kara Van Park), Diane Horan Hill, Roxx, Sum Ting Wong, The Drag With No Name, The Vixens, Mary Mac, Melissa Totten – Madonna Impersonator, La Voix’s Va Va Voom Boys. Doors open at 16:00 with donations welcome. Entry is £4 from 19:00 through to 03:00. All door monies go to charity. Pecadillo Pictures’ unflinching look at the world of Chemsex is being screened at the Clapham Picturehouse (76 Venn St, SW4 0AT) at 8:30pm on Monday 30 November as part of the “Out At Clapham” series of film screenings. David Stuart, the Wellbeing programme curator at 56 Dean Street and the film’s directors Will Fairman and Max Gogarty will lead a Q&A session following the screening. Chemsex is also being screened with a Q&A ahead of its general release at Curzon Soho on Tuesday 1 December and the Institute of Contemporary Arts (The Mall, SW1Y 5AH) on Friday 4 December. The National AIDS Trust, Attitude Magazine and Sink The Pink are holding a pop-up Kissing Booth in Soho Square as part of the Rethink HIV campaign. The booth is a response to NAT research which shows 16% of people wrongly think you can get HIV from kissing, up from 4% ten years ago. You are invited down to get a kiss in booth with one of Sink The Pink drag performers or “Red Hot” model Alex Mountain who recently starred in the exhibition by Thomas Knights. The booth is open from 11am to 3pm. 56 Dean Street Clinic will be offering HIV tests from 1pm to 8pm at G-A-Y Bar on Old Compton Street. 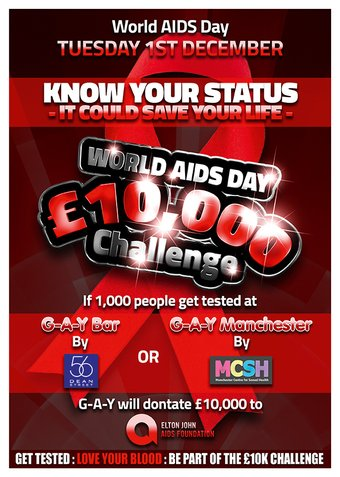 Not only that, if 1,000 people are tested at G-A-Y Bars in both London and Manchester, G-A-Y will donate £10,000 to the Elton John AIDS Foundation. Ku Bar’s World AIDS Day Auction returns this year from 6pm on Monday 30 November at Ku Bar Leicester Square (30 Lisle Street, WC2H 7BA). Last year’s auction raised thousands of pounds and all proceeds go to The Food Chain. Details of the lots open for bidding will be available soon online. The Food Chain will also have collections at Ku Bar throughout the preceding weekend. 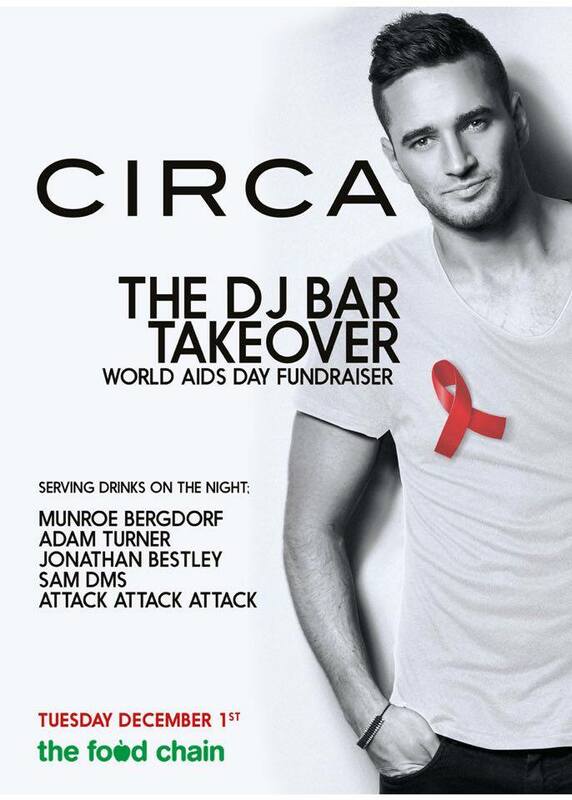 Circa’s resident DJs Adam Turner, Munroe Bergdorf, Jonathan Bestley, Sam DMS and Attack Attack Attack swap the DJ booth for the bar and will be serving drinks all night at Circa (62 Frith Street, W1D 3JN) to raise money for The Food Chain. 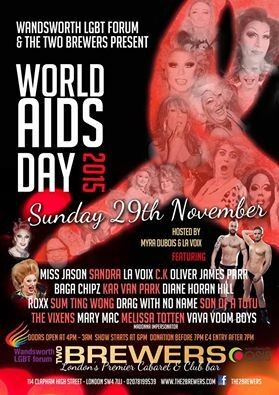 The Royal Vauxhall Tavern (372 Kennington Lane, SE11 5HY) hosts “Deconstructed” a fundraiser for GMFA. Chris Marshall and James “Biddie” Biddlecombe introduce emerging talents and scene favourites, including La Voix, Angie Brown, Aruan Duval and Kara Van Park performing new stripped back versions of classic songs, from the new album Deconstructed. Doors open at 7pm and tickets are £10. Finally, if you’re stopping by at Soho Gyms in Covent Garden, you’ll find collections for The Food Chain. This entry was posted in London - City Wide and tagged Gay, London, World AIDS Day. Bookmark the permalink.